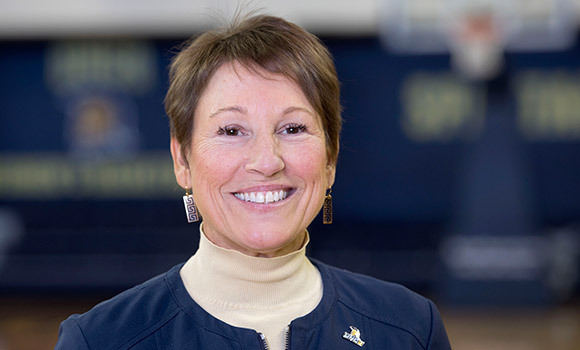 UNC Greensboro Director of Athletics Kim Record and four UNCG alumni have been named winners of the Triad Business Journal’s 2019 Outstanding Women in Business Awards. The five Spartans are among 23 women across the Triad to be recognized for their leadership and the ways in which their contributions have left an indelible mark on the community. In her 10th year as director of athletics, Record leads the University’s 17 athletic teams, more than 225 student-athletes, and 90 staff members. Record has led UNCG to unprecedented athletic success, both on and off the court. During the 2017-18 academic year, UNCG’s athletic teams won five Southern Conference Championships and earned a best-ever 3.23 GPA. The success has continued this year, with women’s soccer winning its second consecutive Southern Conference Championship, and men’s basketball setting a new program record for wins (28), placing second in the Southern Conference Tournament, and earning the No. 1 overall seed in the National Invitation Tournament. Additionally, under Record’s leadership, UNCG Athletics launched the Campaign for Champions in January. The fundraising campaign is focused on transforming student-athlete academic and support facilities, and recruiting and retaining top coaches. Jennifer Ann Causey Johnson ’09, ’10 MSA, owner, Gate City Accounting Solutions Inc. The Triad Business Journal’s awards ceremony will be held Thursday, April 4, at 5:30 p.m. at Grandover Resort and Conference Center. To learn more and to see the full list of award winners, visit the Triad Business Journal website.